We're excited that you've chosen to apply to Chapman University. We can't wait to read your application! If your goal is to have a great application, look below to see a preview of our Chapman University Questions in the Common App and a quick explanation of what we're looking for in each. Note that these aren't all the questions we ask in our application. You may have additional questions based on your major choice and based on whether or not you're a first-year or transfer student. You'll have to start filling out your application to see all of the questions we'll be asking you! 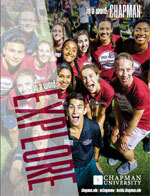 How have you learned about Chapman University? We'd like to know more about how you've interacted with Chapman. This helps our counselors figure out your familiarity with campus and where our staff and faculty might have interacted with you before applying. Telling us about your interest in your potential major lets us know more about why you feel the major might be a good fit for your skills as a student and about your familiarity with your potential program. Developed answers show us that you have an understanding of what you want to study and how it might relate to your career pursuits after college. If you’re applying as an Undeclared student that’s fine! Research our programs first, then tell us why you’re undecided. This is an open-ended question with no “right” answers. Don’t overthink it! Think about the ‘I Am Chapman’ campaign, what it entails, and how you identify or connect with this aspect of campus. Just like the other short-answer question in the “choose one of two” section, think about how this initiative applies to you. Again, there’s no “right” answer here. Think about how you would invest yourself in our campus community. We're looking for specifics here! What separates Chapman from the other institutions you're considering? What special programs, activities and aspects of campus are most attractive and compelling to you? We're well aware that our campus is in a fantastic location and is aesthetically pleasing (we hear about Disneyland and how beautiful our campus is frequently). Dig a little deeper to show us you know why Chapman could be a great fit for you!